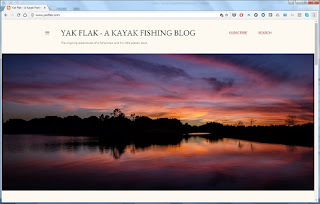 My blog has been getting sort of over-run by kayak and fishing posts lately. Ten In One was always meant to be eclectic, but over time it's evolved an identity (as least to me) of a personal journal about art, technology, and life. Fishing and kayaking just seemed a bit too much of a stretch, especially my posts about kayak gear and outfitting. So I decided to create another blog dedicated 100% to my fishing and kayaking activities. I call it YakFlak.com. If you're interested in that sort of thing, please visit. As part of that change, I've deleted all but my first kayaking post from this blog. In the future, I will undoubtedly post artful photos from my kayaking adventures here, and maybe some other kayak-related posts that also happen to be thematically aligned with the editorial slant of Ten In One. But other than that, I'll be segregating the content.